Eighth place in the Western Conference is up for grabs; Who takes it? The two dates are connected, as every GM now has until the first date to project, to the best of their knowledge, where their team will be on the second. Outside of the playoff picture? Then it's time to start preparing for next year. Inside? 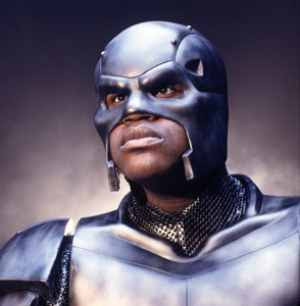 Time to patch holes where possible and steel up, Shaq-style. So who's where in the Western Conference? Barring some kind of zany miracle or Rookie of the Year-style turnaround, three teams (the Edmonton Oilers, Columbus Blue Jackets, and Anaheim Ducks) can all safely begin planning for next year. On the flipside, six teams (the Detroit Red Wings, Chicago Blackhawks, Vancouver Canucks, San Jose Sharks, St. Louis Blues, and Nashville Predators) are all nine or more points clear of 8th place, and can probably begin screening their logos onto cheap towels. That leaves two spots up for grabs, and if you think, as I do, that the 7th place Los Angeles Kings are trending up rather than down, despite being only four points ahead on 8th, you could argue there's only one spot available. And that last spot could go to anybody at this point. From 8th to 12th place, there are five teams (the Calgary Flames, Dallas Stars, Colorado Avalanche, Phoenix Coyotes, and Minnesota Wild) within three points of each other, and none have looked particularly strong of late. Only Calgary has 5 wins in their last 10 games. Dallas and Colorado have 4, Phoenix and Minnesota only have 3. But one of these teams is going to get hot, or at least hotter than the others. Which team is the Alec in this pack of Baldwins? I'm putting my money on the Colorado Avalanche. They have the 7th-ranked powerplay, they win a lot of faceoffs, Matt Duchene is returning from injury, and they're a youthful team that could catch fire down the stretch. Of the five bubble teams, they're not just the only team in the top 10 both in shots for and shots against, but the only of the group that averages more shots per game than they allow. In short, they're the only of the Western Conference bubble teams that has shown the ability to control the play on a semi-regular basis. Goaltending has been their struggle thus far. Offseason acquisition Semyon Varlamov has been downright poor of late, recently having surrendered 10 goals in his last 2 starts. He's carrying a 3.00 GAA and an .899 save percentage and has lost the starting job to J.S. Giguere. But I'm of the mind that they can get this sorted out. They're my pick for the Western Conference's final playoff spot.